Semi-shade is a condition where a plants gets between two and six hours of sunshine a day. Shrubs for semi-shade fill in the spaces in front of large, shade-producing trees or in spaces where the shadow of a building falls in the afternoon. 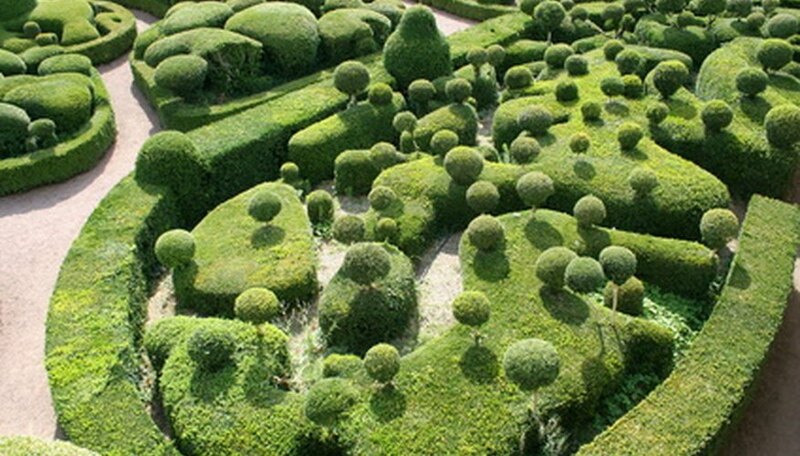 Shrubs cover a wide space. Just a few shrubs cover up bare spots, turning them into colorful, eye-catching garden spots. New Jersey tea (Ceanothus americanus) is a deciduous shrub hardy in U.S. Department of Agriculture planting zones 4 to 8. The shrub grows from 3 to 4 feet tall and 3 to 5 feet wide. White flowers grow in cylindrical clusters from 1 to 2 inches long and bloom from May to July. Medium to dark-green, egg-shaped leaves measure 4 inches long. Plant in a moist, well-drained soil. Bog-rosemary (Andromeda polifolia) is an evergreen shrub that grows up to 2 feet tall and about the same in width. The shrub produces dark-blue to green leaves and white-urn-shaped flowers that are tinged with pink, grow in umbrella-shaped clusters at the tips of the branches and bloom in May. Bog-rosemary needs a sandy soil with peat moss and a soil that is consistently moist. The plant is hardy in USDA zones 2 to 6. Tatarian dogwood (Cornus alba) grows up to 8 feet tall and 8 feet wide and likes moist to wet soils. Medium to dark-green elliptic-shaped leaves become green, chartreuse or green-purple in the fall. Small, cream-colored flowers bloom in late May and early June growing in clusters about 2 inches in diameter. White fruits grow in clusters from June through August. Tatarian dogwood is hardy in USDA Zones 2 to 7. Winter hazel (Corylopsis pauciflora) is hardy in USDA zones 6 to 8. The plant is a deciduous shrub that grows from 4 to 6 feet tall and the same in width. Yellow flowers bloom in March and April growing in drooping clusters up to 1 1/4 inches long. Bright-green, egg-shaped leaves up to 3 inches long appear after the flowers and turn yellow or yellow-green in the fall. Plant winter hazel in rich, organic will-drained soil. Common boxwood (Buxus sempervirens) grows from 6 to 20 feet tall with a spread of 10 to 15 feet and is hardy in USDA Zones 6 to 8. Oblong or egg-shaped evergreen leaves grow up to 2 inches long and green flowers bloom in the spring. The flowers are followed by tiny, hard fruits. Plant common boxwood in a soil that is moist and well-drained.